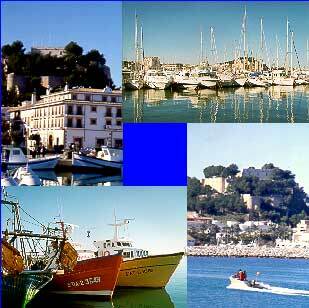 DENIA has almost twenty kilometres of coastline. To the north of the town, there are beaches of fine sand and shallow waters such as Les Marines, L'Almadrava, Les Deveses, Les Bovetes and els Palmars. To the south lie a series of small coves along the rocky coast, known as Les Rotes, which is a paradise for fishermen and divers. The Montgó Mountain, shared by Denia and Javea, is the major landmark of the area. The town sits at the foot of a hill crowned by a castle, a fortress containing the remains of all the people that once paused here on their way through history. The castle is the residence of the erstwhile Marquis of Denia, and of note are the Mig, Galliner and Carsell towers, and the so-called Palace of the Governor, as well as its walls and bastions. 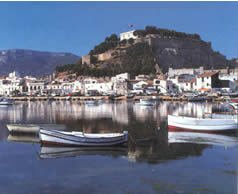 From the hilltop esplanade you'll have an excellent view of Denia and its environs. Among the monuments in the town, we would recommend a visit to the 18th-century church of the Asunción; the 17th-century Atarazanas (dockyards); the cloister and church of San Antonio and the 18th -century, neoclassical town hall building. Outside the town we can suggest the so-called hermitages of the conquest- Sant Joan (gothic), Santa Paula and Santa Lucía (gothic), constructed in the 14th and 15th centuries, and also the Torre del Gerro (17th C.) located en the cliff next to the cape of San Antonio. Make your way up to the castle and visit the Archaeological Museum. The exhibits will take you on a journey through the past, from the 2nd century B.C. to the 18th century of our era. The Ethnological Museum in town provides an interesting showcase highlighting Denia's traditional crops, particularly the production of raisins. If you feel strong enough, conquer the peak of Montgó (about 5 hours in all), You'll find it hard to forget the panoramic view from the top. On a clear day you can see the island of Ibiza. Windsurfers should head straight for the end of Las Marinas, an area held in high esteem by their kin. If it's nightlife you want, there's an incredible array of cafes, pubs, discos and nightspots in the Las Marinas district. Water sports are tops in Denia. Sailing, windsurfing, diving, fishing, row rig, swimming or whatever you want. Denia has a complete infrastructure, with a marina offering 546 moorings and a full range of services and equipment. Landlubbers also have an extensive range of activities to choose from: mountain climbing or hang-gliding, mountain biking or hiking. There's also an 18-hole golf club in the vicinity, the Club La Sella, designed by José Maria Olazabal.